If highlighted, click to register for a current course. STUDENT PROGRAMMING – designed to promote respect for human dignity and diversity in the school community; access requires registration. EDUCATOR PROGRAMMING – resources and content to support K-12 teaching and learning; access requires registration. Continuing Education credits can be earned from Boise State University for individual course completion; additional registration and payment required. 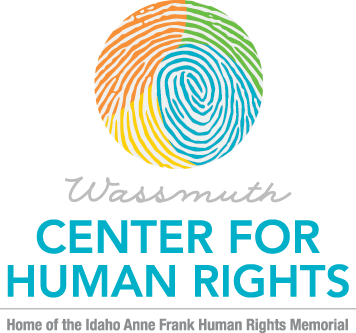 HUMAN DIGNITY PROJECT – programming and resources designed to support professional development; access requires payment and registration. The goal of the Human Dignity Project is to move from that which inspires to the full realization of human rights for all people. In this project we provide learners with an opportunity to examine the manifestations of inequality, challenge the social construction of discrimination, and confront injustice wherever it occurs. The Project builds upon the Spiral of Injustice as a model for examining how humanity devolves when “the other” is demeaned or marginalized in the community. To review e-course content and/or to register, click Human Dignity Project.